Tracking this one down was no easy feat. Heading out into the blistering cold temperatures on Christmas Day, it took three movie theater’s before I could find a showing that was not sold out. Sitting in the very first row of a very small theater, I can’t say I was overly joyful with my viewing situation. Regardless, I stuck it out, knowing that this was a big one to knock off my award season list. The Kings Speech will be this years true indie release. While Black Swan and 127 Hours aren’t exactly blockbusters, this movie has the indie vibe, missing from these other films. 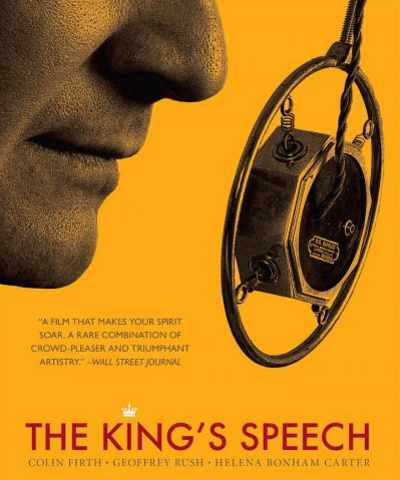 Based in World War II England, the story follows King George VI as he attempts to overcome a stammer he developed when he was a child. Being a figurehead in England, he is often required to give public speeches to massive audiences and fails miserably early in his life. Enlisting the help of countless doctors, his wife, played by Helena Bonham Carter finally seeks out the character played by Geoffrey Rush. There are two qualities that make this movie great, both centered around the core cast of characters. First, is Carter’s incredible performance. Known for roles in Tim Burton movies (they are married) and as Bellatrix Lestrange in the Harry Potter saga, this is a role that breaks her from that dark typecasted role. She clearly stands on her own and defines her role in this movie apart from the male characters. Already nominated for a Golden Globe for the role, it wouldn’t shock me to hear her name come Oscar season. Rush and the star of the movie Colin Firth make up the other amazing dynamic in The Kings Speech. The well-spoken Rush and the barely-able-to-form-a-sentence Firth create an on-screen chemistry that is incredible. Their interactions are dazzling from a writing standpoint and each of them is able to play the part brilliantly. Amazing as it sounds, the near two hour movie centered around a non-life threatening speech impediment has clear movement. The audience is sucked into this world and completely engaged for most of the movie. While there are some stagnant moments, all three main characters provide comic relief at the right time, helping to move the story forward. Awards shows always love the half indie/half mainstream film. With high caliber actors and a very non-commercial story line, this movie fits the mold perfectly. All three characters were nominated for Golden Globes (Rush in a supporting role, Carter in a supporting role and Firth in a leading role) and looking over the competition it wouldn’t shock me to see a few awards given to this film. In addition, this movie is most certainly one to see before making your Oscar picks in 2011. Very well written article. It will be valuable to anybody who utilizes it, including me. Keep doing what you are doing – looking forward to more posts.